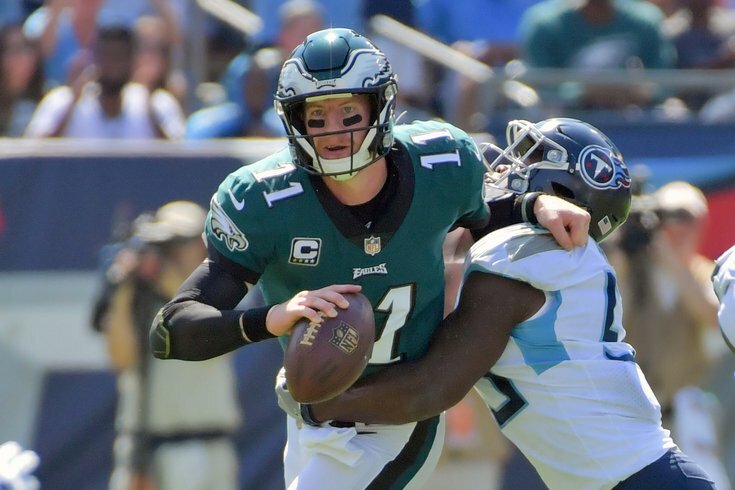 Philadelphia Eagles quarterback Carson Wentz is tackled by Tennessee Titans linebacker Jayon Brown. The Philadelphia Eagles got back in the win column last week with a 20-16 victory over the Indianapolis Colts, after dropping their Week 2 matchup against the Tampa Bay Buccaneers. In Week 4, they'll play a second consecutive AFC South team in the Tennessee Titans down in Nashville. The Birds will probably be getting Alshon Jeffery back this week, assuming he gets over an illness, but that good news is offset to some degree by the loss of safety Rodney McLeod, who tore his MCL and is likely for the season. So far in 2018, the Eagles have been snake-bitten by injuries, as they have four contributing players on injured reserve, and two more PUP/NFI. The Titans, meanwhile, faced some injury adversity early this season, but their injury report is far cleaner than Philly's. Here's the final Friday Eagles-Titans injury report heading into Week 4. As we noted in our five matchups to watch, the Titans love to run the ball, and they don't exactly do it all that well. That is a matchup advantage that heavily favors the Eagles, who had the No. 1 run defense in the NFL in 2017, and still do in 2018. On the other side of the ball, the Titans are short on star power, but they play team defense and have done a good job creating ways to get to the quarterback. The betting lines opened for this game at Eagles -3, and have stayed there throughout the week. Here are our staff writer picks, as well as who other publications are picking, and finally, some additional over-unders. For the gambling degenerates here are my Week 4 NFL picks.